Féach an bf Cluain Caoin (#27848) a thug ainm do par Cluain Eidhneach agus Cluain Caoin, i mbarúntacht Phort Laoise Thiar. · F, Paragraph 713 Fearann Ó nDúnlaing? · F, Paragraph 724 Tuath Ó bhFiodhbhaidhe? · F, Paragraph 724 Tuath Ó bhFíodhbhaidhe? Clonenaghe ... Clonehere ... Clonynagh, [Clonekenny], Clonekyn? · Cotton Map Fearann Ó nDúnlaing? · Cotton Map Tuath Fiodhbhaidhe /Tuath Ó bhFiodhbhaidhe? 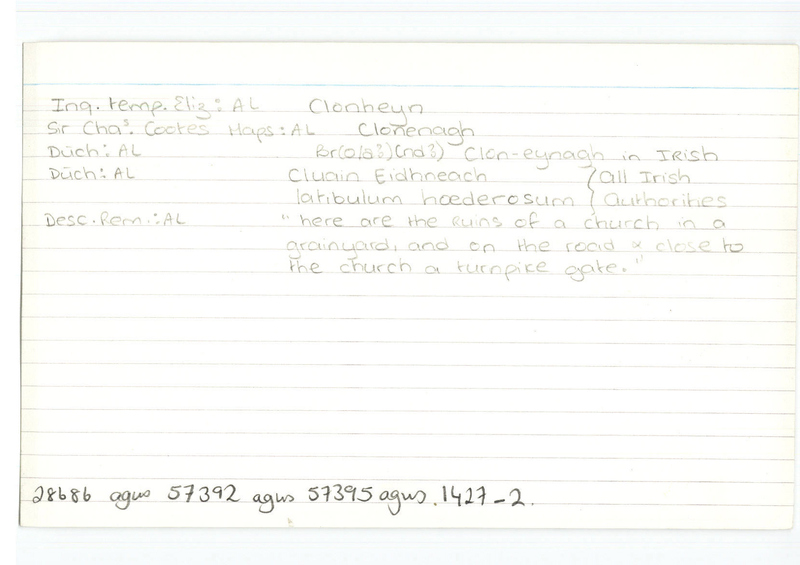 Clonenaghe ... Clonihere, Clonynaghe, Clonehenny, Cloynekine? Clonenagh, Clonehein, ... Clonehenny?, Clonekin? · DS bar. Cullinag DS; ionann is par. Abbeyleix SO, bar. Cullenagh; sa phar. úd atá bf Clonkeene DS / Clonkeen SO. · DS bar. Upper Ossory; ionann is par. Abbeyleix SO, bar. Clarmallagh; taobh le par. Cloneheene DS, bar. Cullinag. · Hib. Del. (bar.) Cullinagh Hib. Del. ; ionann is par. Abbeyleix SO, bar. Cullenagh; sa phar. úd atá bf Clonkeene Hib. Del. / Clonkeen SO. · Hib. Del. (bar. ) Upper Osserey; ionann is par. Abbeyleix SO, bar. Clarmallagh.